I have become a member of many webrings, and become acquainted with many different webring services, but nowhere have I found a webring devoted to peafowl. Sure, there are tons of bird webrings, and a few pheasants and gamebird rings, but none for peafowl alone. So, I have created two of my own using yahoo's webring services. Now I know many people don't like yahoo webrings, and I personally feel that webring.com had nicer webrings before yahoo took it over, but yahoo has some advantages. I would not be able to make a webring in most other services because I don't currently have the HTML knowledge to make the complicated webring tables necessary for other services. And until I do, these webrings with the yahoo navigation bar will have to do. But yahoo has made it very easy for me to create and manage these webrings so I have to give them some credit. So please, come join my webrings and lets build a community of peafowl lovers throughout all the web. 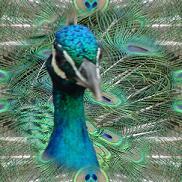 I currently have two webrings, The Love of Peacocks and Peafowl Webring, and The Peafowl Informational Webring. Please read my requirements and join one of my rings, or both! The Love of Peacocks and Peafowl Webring: This was my first webring, and it is open to everyone who appreciates the beauty of peafowl. So if you stopped by this site and enjoyed learning about peafowl or seeing them, than you can join this ring. Your site does not have to have anything to do with peacocks to join (although it certainly can). So, if you have a minute, please stop by and join us! The Peafowl Informational Webring: This webring is newer and a little more specific. I created this ring so that people with peafowl related sites can join together to help others find out anything they want to know about peafowl. This ring is for those whose site actually has something to do with peafowl. You're whole site does not have to be devoted to them however, as long as you have at least one page of peafowl material that is easy to find. Sites that sell peafowl are also welcome.